For nearly one hundred years, artists have been using non-traditional objects to create art. In 1915, Marcel Duchamp coined the term readymade to describe his found art. In the 1980s and 1990s, many artists began focusing on mass-produced items. 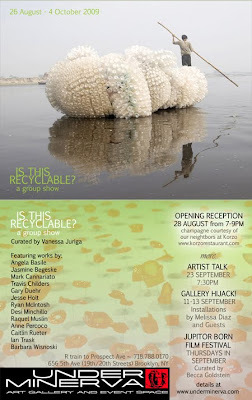 At present, several artists are using discarded objects and recycled materials as their medium. Is This Recyclable? contemplates whether this trend is a response to environmental issues, commentary on the increase in consumerism or an attempt to uncover new meaning for the object.